Before people were even able to participate in our survey, a few bizarre conclusions started surfacing. Cartel partners CD&V (Christian Democrats) with N-VA (Flemish nationalists) and VLD (liberals) with Vivant (progressive liberals) were very present that election year. What’s quite remarkable is that neither of both cartels have any values in common? The two most outspoken parties, Vlaams Belang (extreme right) and GROEN! (green party) share a staggering 40% in common values, while they couldn’t be more different. Three other political parties have at least 1 value in common with Vlaams Belang and VB doesn’t even claim ‘being Flemish’ as one of their values! Shouldn’t that be a pretty fundamental value when the word ‘Vlaams’ (Flemish) is a part of your party name? Sp.a (socialists) also miss the mark because they didn’t include values such as ‘social’ and ‘work-oriented’ in their set of values. Only 1 in 5 belong in their party! 4 out of 5 politicians don’t fit in with their own party. Those are the results. The winner of this survey is VLD. 40% of voters that tested a VLD politician appointed the right VLD values. This means that VLD has the most politicians that actually belong in their party. 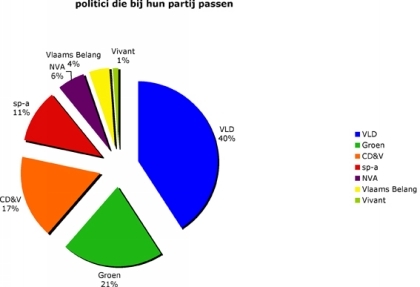 CD&V and Vlaams Belang politicians seem to be the most of out place in their own party. The correct party values were assigned by 27% and 25% of the voters. Below you can see which parties have the most “fitting” politicians. Which values were selected the most and are considered to be the most important by Flemish voters? The top 10 most and least selected values shows 80% of all values that are represented by VLD are in the top 10 of the most selected values. You could say that VLD’s values were of the most relevance to voters at the time of this research.